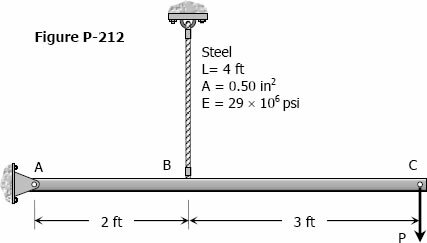 A steel rod is stretched between two rigid walls and carries a tensile load of 5000 N at 20°C. If the allowable stress is not to exceed 130 MPa at -20°C, what is the minimum diameter of the rod? Assume α = 11.7 µm/(m·°C) and E = 200 GPa. A steel rod with a cross-sectional area of 0.25 in2 is stretched between two fixed points. The tensile load at 70°F is 1200 lb. What will be the stress at 0°F? At what temperature will the stress be zero? Assume α = 6.5 × 10-6 in/(in·°F) and E = 29 × 106 psi. The rigid bar ABC shown in Fig. P-212 is hinged at A and supported by a steel rod at B. Determine the largest load P that can be applied at C if the stress in the steel rod is limited to 30 ksi and the vertical movement of end C must not exceed 0.10 in. A pipe carrying steam at 3.5 MPa has an outside diameter of 450 mm and a wall thickness of 10 mm. A gasket is inserted between the flange at one end of the pipe and a flat plate used to cap the end. How many 40-mm-diameter bolts must be used to hold the cap on if the allowable stress in the bolts is 80 MPa, of which 55 MPa is the initial stress? What circumferential stress is developed in the pipe? Why is it necessary to tighten the bolt initially, and what will happen if the steam pressure should cause the stress in the bolts to be twice the value of the initial stress?